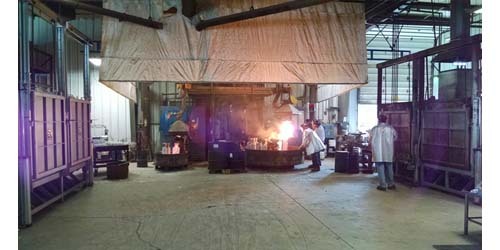 Investment Casting Process – Rimer Enterprises, Inc.
Investment casting using molten brass results in a final product that is very smooth and detailed without flash or parting lines. 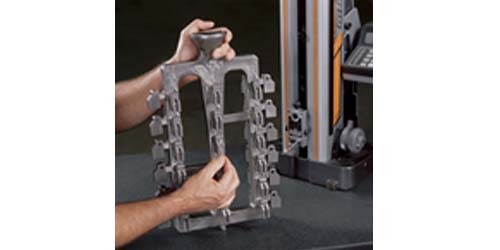 This technique creates parts that are precise and lightweight. A variety of metal alloys may be used, including aluminum, steel, and gold. Almost any castable metal may be investment cast. The investment casting process lends itself well to parts from a few grams to a few hundred pounds; most parts, however, are 15 pounds or less. The main drawback to investment casting is that it is more expensive than other manufacturing methods. However, the equipment cost is typically lower than other methods and after the parts are produced they require little finishing or machining. Brass castings are used in many applications; metal parts are used industrially, commercially, and domestically every day. Investment casting has been used for jewelry making for hundreds of years but is finding modern use in a wide variety of applications including dental and medical tools, engines, couplings, fittings, pipes, propellers, and thousands of other examples in the plumbing, aerospace, automotive, dental, medical, chemical, electrical, construction, mining, food processing, telecommunication, military, sports, and other industries. The first step in investment casting is creating a master die out of wax. This wax pattern can be carved by hand or machine or may be produced through injection molding. The die is an exact replica of the part that is to be produced. It is attached to a wax rod called a sprue. Several hundred wax patterns may be attached to the same sprue or it may be a single pattern. When the master dies are firmly attached, the assembly is inverted and dipped into a ceramic slurry called the investment. It may be dipped multiple times to achieve an even coating and the desired thickness. An alternative method is to mount the assembly in a flask and to pour in the investment. The investment is then left to dry, which requires a number of hours unless the process is aided by a fan or vacuum. After it has dried completely, the assembly is inverted and baked in an oven or furnace in order to melt or vaporize the wax. The mold is heated more than necessary to guarantee that there is no moisture or residual wax inside that would interfere with the liquid brass that is then poured into the space left by the wax. In order to thoroughly fill the mold, the molten metal can be drawn in using a vacuum, positive air pressure, or centrifugal casting methods. Sometimes the force of gravity is enough. The brass cools and once it has hardened into a solid, the investment mold is removed to release the brass casting inside. Brass Investment Casting Brass investment casting is the manufacturing process that creates parts through the metallic replication of wax models.